Jimi Yamaichi — carpenter, World War II draft resister, Tule Lake Committee member, co-founder of the Japanese American Museum of San Jose and community leader — passed away at his San Jose home on May 12. He would have turned 96 in October. “It was his vision and persistence that began and resulted in Tule Lake becoming a National Historic Landmark, which was followed by a presidential executive order that made it a National Monument, which then became a National Park site. “The creation of the Visitors Center and the restoration of the Tule Lake jail, which are now on the brink of happening, were projects Jimi was especially interested in. The Visitors Center, because he wanted to tell the story of the extraordinary hardships that families and especially the children of the segregation center had to endure and the jail, because, as a 21-year-old supervisor of construction, he was what we now call the building contractor for the Tule Lake jail — the most iconic remaining structure of the American concentration camp experience. “Jimi possessed what seemed like a bottomless wealth of knowledge of Tule Lake. He could point out where the two farm tracts were; what crops they grew; where the farm mess hall was; where the hog farm was; how they killed the pigs; where the Army horse corral was; how they got water for 20,000 people; how the sewage system worked — what he knew was literally endless. “At a time when all of the TLP buses gave a tour of the Tule Lake campsite, pilgrims would try to get on Jimi’s bus because his guided tour was the most knowledgeable and fulfilling. Yamaichi was the fourth of 10 children born to Kaneichi and Hatsuko Shimizu Yamaichi of Hiroshima Prefecture. By 1931, Yamaichi’s father had saved enough money to purchase 15 acres of land in San Jose. The father then hired a Caucasian carpenter to build a house on this land, and Yamaichi fell in love with carpentry as a 10-year-old. He knew at that moment that he wanted to become a carpenter and not a farmer like his father. 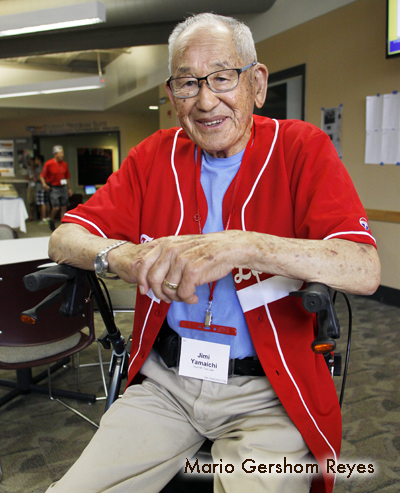 In high school, Yamaichi took carpentry classes, but when he graduated in 1941, he was unable to find a job like his Caucasian friends. According to Yamaichi, many trades such as carpentry, plumbing, and sheet metal work were controlled by powerful unions before the war, and the unions, at the time, were not allowing people of color to become members. To make ends meet, Yamaichi helped out on his family farm in San Jose but never gave up on his dream of becoming a carpenter. When World War II broke out and the U.S. government issued orders for people of Japanese descent living on the West Coast to be placed into U.S.-style concentration camps, the Yamaichi family was first sent to the Pomona Assembly Center in Southern California. 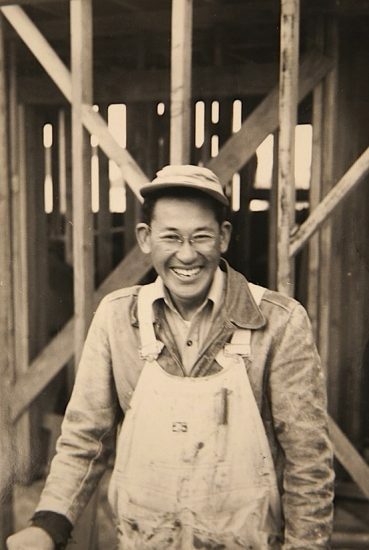 In this undated photograph, Jimi Yamaichi is shown at his job as a construction worker at Tule Lake, where he was tasked with building the prison that would hold some of his fellow internees. Yamaichi was unable to find a job at the assembly center, so he put his carpentry skills to work by making geta from scrap lumber for his siblings. Word of his geta-making talent spread, and soon Yamaichi and another carpenter, Jun Iwaoka from San Francisco, opened a makeshift class for about 20 boys and girls where they taught the children everything from reading a slide rule to cutting lumber safely. From Pomona, the Yamaichi family was sent to the Heart Mountain War Relocation Authority camp in Wyoming, where Yamaichi initially applied for an office job as an engineer but ended up working on the Shoshone canal system that eventually irrigated the Heart Mountain basin. When the controversial loyalty questionnaire came out in early 1943, Yamaichi answered “yes-yes” to Questions 27 and 28 but his father wanted the family to go to the Tule Lake Segregation Center. Although Yamaichi never asked his father why he wanted the family transferred to Tule Lake, he suspects that his father may have thought going to Tule Lake would keep the family together, especially since the family had several draft-aged sons. At Tule Lake, Yamaichi eventually became head of the construction crew. He taught several of the Nisei youths carpentry and construction work, and after the war, he learned that a few of them were able to become union members due to the skills he had taught them. Yamaichi is best known and was most criticized for helping to build the Tule Lake jail, which is still standing. According to Yamaichi, he initially turned down the job but was convinced to do it when Camp Director Raymond Best told him, “If you don’t construct the jail, I’ll hire someone else.” Yamaichi lost several crew members when he agreed to construct the jail. In addition to the jail, Yamaichi and his crew had had a hand in putting the stockade together. They dragged four barracks to an open area, where a makeshift stockade was quickly assembled in November 1943 after a late-night disturbance led to the imposition of martial law with tanks rolling into the camp. Prior to the construction of the jail or stockade, Yamaichi oversaw the construction project of bringing water from a nearby canal to the camp. Tule Lake saw an addition of close to 4,000 Japanese Americans, soldiers and WRA workers when it became a segregation center, and the original sewage system had been unable to accommodate the extra people. The additional water was not only used for the sewage system but was also used for dust control and by the residents for their victory gardens or other such activities. In 1944, when Yamaichi received his draft notice, he decided to challenge it. He made his decision after considering two incidents that had happened. The first involved his older brother, who was serving in the Army. Before shipping out, the brother had visited the family and shared about his experience at Fort Riley, where all the Nikkei soldiers were rounded up and placed into a hangar at gunpoint while President Roosevelt toured the facility. The second incident involved his second cousin, who was also serving in the Army. Before shipping overseas, the second cousin had asked to see his sick father, but at that time, the West Coast was closed to Japanese Americans, even those serving in the Army, so the son never saw his father alive again. The father died of stomach cancer shortly after arriving at Heart Mountain. He was the first prisoner to die there. Yamaichi was one of 26 men to resist the draft from Tule Lake. According to Yamaichi, 27 of them were transported to Eureka to stand trial — 26 for draft resistance and the 27th person on another charge. After the trial, Yamaichi and the group returned to Tule Lake and resumed their camp life. When the war ended in August 1945, Yamaichi was asked by the administration to remain until the camp closed in May 1946. Among his jobs was going through the empty barracks to check for dead bodies. After his release from Tule Lake, Yamaichi returned to San Jose and attempted to join the same union that had turned him down before the war. As expected, he was turned away, but since being a union member meant better wages as a carpenter, he kept returning until the union finally told him that he could become a member if he found a job at a company that was unionized. Yamaichi became a member soon after, breaking the racial barrier. He would go on to work on multi-million-dollar projects but was usually one of the few Asian Americans working in his field. In 1991, after Yamaichi retired, he and his wife, Eiko, participated in a Tule Lake Pilgrimage. This was Yamaichi’s first time back to the campsite since the war years, and it was an emotional return for him. 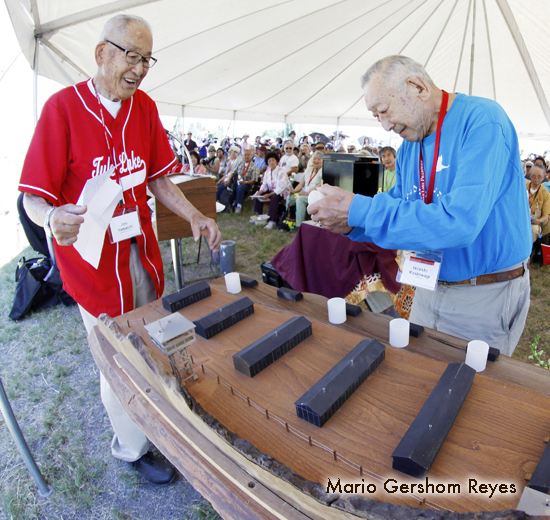 From then on, Yamaichi volunteered as a Tule Lake Committee member, helping to organize the biennial pilgrimage and leading walking and bus tours. Among his many other contributions, he also co-founded the Japanese American Museum of San Jose, received a Kunsho from the Japanese emperor, was one of the first Nikkei to speak out in support of the Muslim American community after the September 11, 2001 terrorist attacks, and constructed a replica of a Tule Lake guard tower, which has been part of a traveling exhibit. He is survived by his wife, four children and many grandchildren. Can you please make a correction in the spelling of his mother’s name to Hatsuko. She was my Bachan and I carry her name as my middle name. Thank you for the incredible write-up on my Uncle Jimi. He did so much for the JA community, especially in San Jose and keeping The Tule Lake Pilgrimage alive. We miss him terribly. Sorry, your comment went to the spam folder. The online article has been corrected and we will also run a correction in the newspaper. America, a country of great people who over come great hardships. I grew up in the San Jose area in the 1950’s and because of people like Jimi the Japanese had great respect.